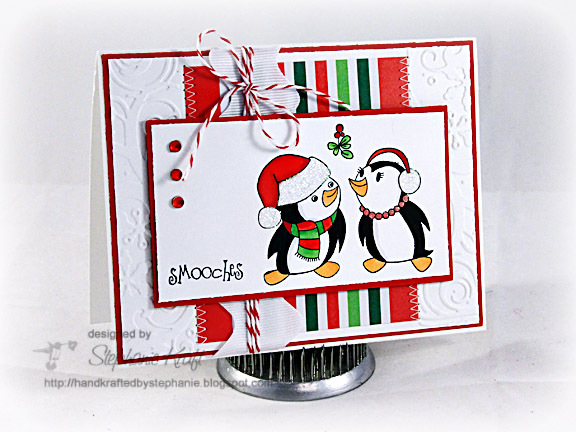 HandKrafted by Stephanie: Mercy's Tuesday Sketch Challenge.. Smooches! Mercy's Tuesday Sketch Challenge.. Smooches! Hello! 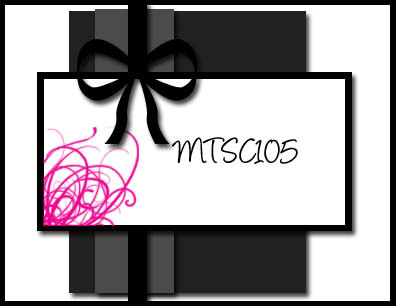 I'm here with my card for Mercy's Tuesday Sketch Challenge, MTSC105. It's another great sketch.. I hope you will find some time in your busy week to play along! I've been wanting to play with Penguin Pals (Taylored Expressions) before this Christmas has come and gone.. aren't these the sweetest little (almost) kissing penguins you've ever seen?! I added a little strip of striped paper (American Crafts) and added some embossing to the sides of my white panel. Accessories: Embossing folder from Winter Wonderland (Provo Craft), Markers (Copic), Starfire glitter (Taylored Expressions), Rhinestones (Kaisercraft), Divine Twine, Ric Rac (May Arts), Foam tape, Thread, Sewing machine. I love what you've done with the sketch! Embossing the side white panels is that little extra that makes your card special!! DARLING, Steph! I just made a set of cards using this set and I forgot how much I ADORE it! I love your card-and that twine is the perfect touch! This is totally drop dead gorgeous Stephanie. Love it!!! Such a cute image and adorable card! Sweet use of the sketch!